Start 2018 Off Right With Teeth Whitening in Kaukauna! Have you recently taken a trip down memory lane by looking at old family photos, only to notice that you’ve changed more than you realized in the last 5-10 years? Of course, you expect there to be a few differences in your appearance – maybe you have a few more grays and the smile lines around your eyes are a bit more pronounced. But you have to admit you didn’t expect your teeth to change so much! There’s so much “anti-aging” information about every other aspect of your appearance, but no one tells you how to keep your smile looking youthful. The good news is that it’s easier to take years off your appearance than you might have thought. Teeth whitening in Kaukauna is a great option that can turn back the clock and give you a whole new reason to smile! Will Whitening Work For You? While enamel, the tough outer layer of your teeth, is extremely strong and durable, it isn’t indestructible! After many years of use, your teeth are bound to pick up some stains and discolorations along the way. Particularly if you frequently enjoy foods and beverages like coffee, tea, red wine and berries, at some point you’ll start to notice that your teeth just don’t shine the way they once did. On the other hand, you may have been born with a darker shade to your teeth than you would have liked. The initial color is determined by genetics, which is obviously out of your control. While nearly everyone can benefit from whitening as they age, some people prefer to whiten earlier in life to help counteract this uncontrollable factor. If you fall into either of these categories, you can expect around 10 shades of whitening from a professional treatment. 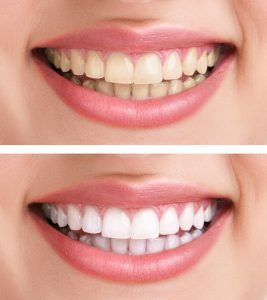 There are some relatively rare cases of severe discoloration that doesn’t respond well to bleaching, in which case your dentist may recommend porcelain veneers. A great way to find out if you’re a good candidate for traditional whitening is to schedule a consultation with a cosmetic dentist in Kaukauna where you can discuss your specific needs and goals. What Can You Expect From Professional Whitening? — Schedule a professional cleaning and checkup. Your dentist will make sure everything is healthy to make sure you get the best possible result from your whitening treatment. — Impressions will be taken so that custom-made trays can be made. — You’ll return for a short second visit to pick up your trays and a whitening gel to use at home. Your dentist in Kaukauna will go over the instructions and answer any questions you may have. — Usually patients will use the trays once a day for 1-2 weeks until they have their desired result. Depending on your diet and other factors, most people will have results lasting around 12 months. Typically people will touch up once or twice a year by wearing their trays for several days at a time. One of the best things about this procedure is that you’ll keep your trays indefinitely, and can whiten as often as you’d like! Drs. Bob and Heather Heil, a husband-and-wife team, are graduates of The University of Minnesota School of Dentistry and have been practicing for nearly 20 years. In addition to providing excellent general and restorative care, they also love the cosmetic work they do. When it comes to whitening, they truly enjoy seeing how a bright smile can change their patient’s lives for the better. They can be reached for questions via their website, or at (920) 788-6280. Comments Off on Start 2018 Off Right With Teeth Whitening in Kaukauna!